The National Energy Board heard about the need for local jobs, as well as environmental and safety concerns, when a series of national public hearings for TransCanada Corp.'s proposed Energy East pipeline began in Saint John on Monday. The National Energy Board heard about the need for jobs TransCanada Corp.'s proposed Energy East pipeline would bring to New Brunswick, as well as environmental and safety concerns regarding the $15.7-billion project, as national public hearings kicked off in Saint John on Monday. A three-member panel, tasked with deciding the fate of the controversial proposal that would see Alberta crude shipped 4,500 kilometres to a marine terminal in Saint John, is scheduled to hold 10 sessions along the route before December. Supporters and opponents to the proposed Energy East pipeline project gather outside the National Energy Board's public hearing in Saint John on Monday. (Connell Smith/CBC)Dozens of buildings trade workers gathered outside the Saint John Trade and Convention Centre before Monday's hearing to show their support for the project. Some, like labourer Gary Bannan, stood in front of a piece of pipeline and offered thumbs up. "There's no work on the east coast, so the pipeline is essential for everybody," he said. "We need the work down here," agreed Cyrus LaRonde-Kingston, a fellow member of the Labourers' International Union of North America (LiUNA). About 38,100 New Brunswickers were unemployed in July, according to the latest labour figures from Statistics Canada. Of those, roughly 13,000 are from the goods producing sector and "would go to work tomorrow for a project," Joel Richardson, vice-president of the Canadian Manufacturers & Exporters, New Brunswick division, told the panel. 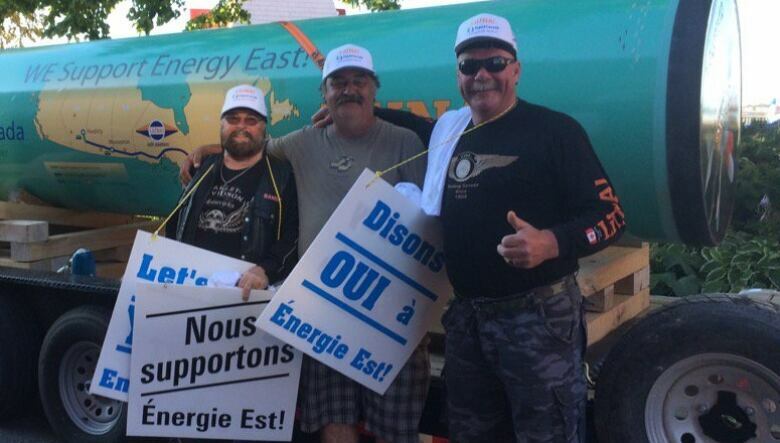 Energy East would create "much-needed" jobs in the short, medium and long-term over the life of the project, he said. It's "viewed by the manufacturing industry as a tremendous opportunity for companies not just to supply goods, equipment and expertise, but to also bring stable and long-term economic prosperity to Atlantic Canada and our province." Richardson was one of about eight registered interveners on Monday, with at least another two dozens scheduled for Tuesday and Wednesday, including the City of Saint John, the Conservation Council of New Brunswick, Canaport LNG, and several First Nations Groups. Colin Sproul, of the Fundy Inshore Fishermen's Association, expressed concern to reporters about the impact the project could have on his livelihoood and the environment in the event of a spill from one of the estimated 280 crude oil tankers expected to be plying the shipping lanes each year. "I'd like to highlight the important fact that a surface oil spill in the Bay of Fundy will travel faster than any other place on earth. The fastest tides in the world mean the fastest spreading oil in the world, with no means to mitigate it our stop it in a quick fashion," said Sproul. He also questioned what methods could be used to clean up a bitumen spill from the floor of the bay, given the extreme tides. "It is physically impossible," he argued. 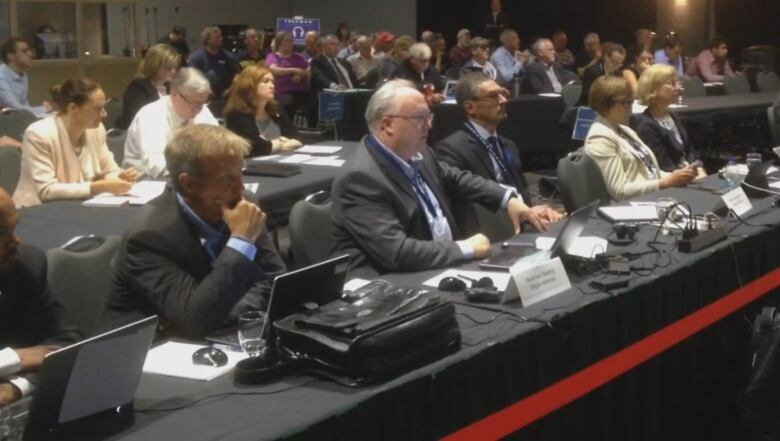 The NEB began its hearings into the proposed pipeline project in Saint John. Groups are prepared to offer their views on the 4,500-kilometre, $15.7-billion project. (CBC)Area resident Gary Prosser, is worried the tank farm will drive down property values and the quality of life. "TransCanada has displayed a total lack of regard and concern for local residents by placing the tank farm so close to our homes," he said. If the NEB approves the project, Prosser requested a condition be imposed that the tank farm be moved away from the residential Red Head area. "This can be done on the eastern end past Hewitt Road on Bayside Drive and would remove much of the opposition to this project," he said. Calgary-based TransCanada Corp. stressed its commitment to safety and concerns for the environment during the hearing. "TransCanada's capability and performance in terms of emergency response is world-leading," said vice-president John Van der Put. Its model breaks the system down into small segments and provides high sensitivity for leak detection, he said. "​Our tests have shown the ability to detect loss of one per cent of flow within a two-hour period." 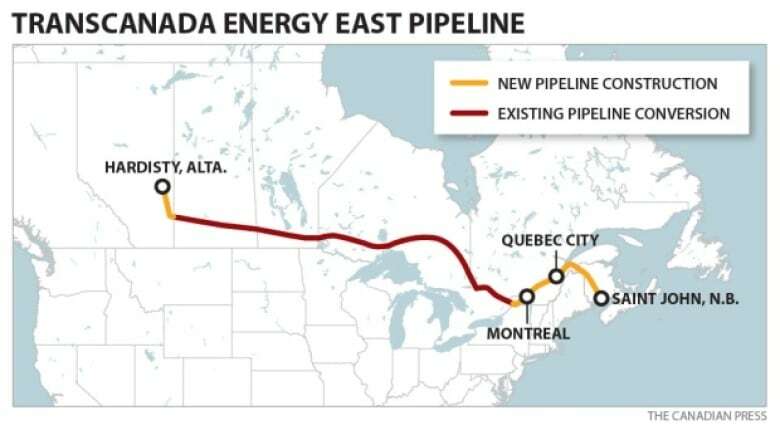 TransCanada Corp.'s proposed pipeline project, which would carry 1.1 million barrels of crude oil a day from Alberta through Quebec to an export terminal in Saint John. (Canadian Press)Earlier in the day, John Soini, president of the Energy East pipeline project, told Information Morning Saint John that TransCanada views the regulatory hearings as another chance to speak with people living near the proposed Alberta-to-New Brunswick pipeline. "For us at TransCanada and specifically for the Energy East pipeline project, we see this as a great opportunity, another opportunity for the proponent of the Energy East pipeline project to listen, to be transparent, to respond to questions and concerns related to the project," he said. Soini said the company has been speaking with citizens and organizations along the pipeline route since 2013, including roughly 3,200 different meetings with communities. "A lot of the concerns and questions were related to safety … as well as environmental concerns," Soini said. "So we would have in-depth discussions with regard to pipeline safety, we would talk about construction practices, specifically watercourse crossing practices." Various environmental and aboriginal groups are fiercely opposing the pipeline. Ron Tremblay, grand chief of the Maliseet Grand Council, cited traditional beliefs about the land, water and air. "For this reason, we oppose the Energy East pipeline in order to protect our non-ceded homeland and waterways, our traditional and cultural connection to our lands, waterways, and air," he said in a statement. The project, however, has been backed by New Brunswick Premier Brian Gallant's Liberal government. Gallant has travelled to other provinces to discuss his support for the project. He also debated Montreal Mayor Denis Coderre on the popular Tout le monde en parle earlier this year. The second New Brunswick session is slated for Aug. 15 in Fredericton. NEB hearings will continue in nine other cities, and scheduled to finish in Kingston, Ont., in December. The regulatory board must hand in its report to the federal government by March 16, 2018. Energy East project given support by former ambassador to U.S.